It’s been so long since I’ve read any garden advice from you that I thought I’d write to tell you about my garden and try to entice you to visit and answer just a few questions. Oh, sure, I know Dr. Hortfreud is always here, but she is better about explaining my feelings about gardening and you excel at giving me pragmatic advice on this whole business of gardening. Truly, there is a need for both of you. Anyway, you would not believe how the garden has changed since you were here in mid-May. Remember, that was the day when you quite rationally explained that garden fairies really do exist. I know you were concerned then that I hadn’t yet planted the vegetable garden. You’ll be pleased to know that I finally got to it around May 31st. Even with that late start, the corn is now shoulder high and there are green tomatoes on nearly every tomato plant. I've enclosed a picture clipped above so you can see for yourself. Yesterday, I spent several hours weeding the vegetable garden, mostly getting rid of all that darn purslane that is my nemesis in the garden, more so than rabbits if you can believe that. After I finished weeding, it seemed so dry (no rain for a week!) that I put the sprinkler on it for about an hour. This morning when I went out to check the garden before leaving for work, I was shocked. It looked as though everything had grown by inches, if not feet, overnight. Oh, why am I’m prattling on about the vegetable garden when I have the most exciting news to share!? You will never guess or maybe you will? I went outside yesterday and found a green bandana hanging from a low branch of the locust tree. You know what that means! In spite of my foibles and failures of gardening, I must have had enough success and experience in the garden to qualify for membership in The Green Bandana Garden Club. Now I’m on high alert for a letter, a call, or some communication from the club to tell me “what next”. It’s all so secretive that I honestly have no idea what will happen. I just know I finally have my green bandana and no one can take it away from me! Do you happen to know anything about this garden club or who recommended me? I’ll bet you do! You have to come visit and tell me if you know something! Besides, there is much to see in the garden these days, and it isn’t all vegetables. 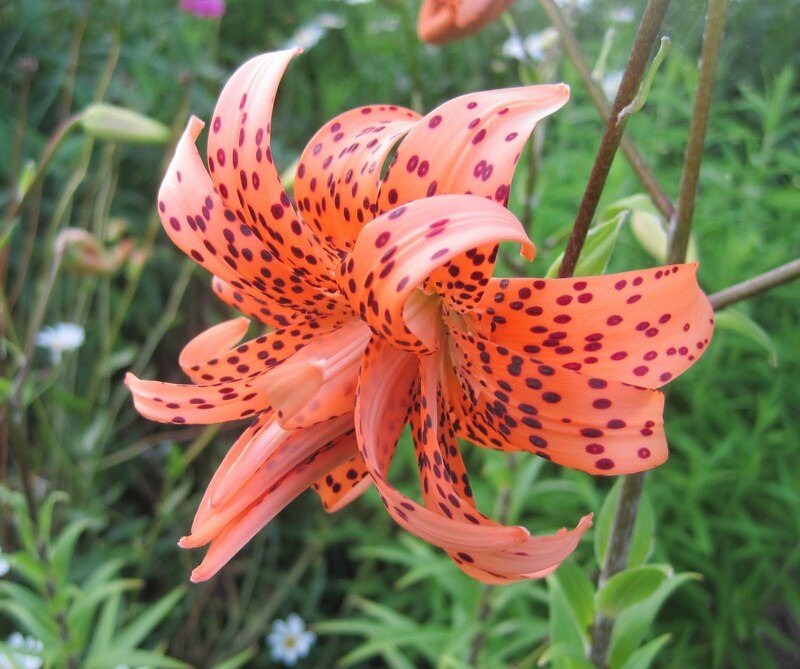 Out in Plopper’s Field you’ll be excited to see that the double flowering tiger lily, Lilium lancifolium ‘Flore-Pleno’, is blooming. Anyway, enough about me and my garden and the garden club. Please come and visit! You have an open invitation to come visit anytime, to provide some good old-fashioned gardening advice, and of course tell me what you know about The Green Bandana Garden Club. I'll have some iced tea for us to drink. Those garden fairies sure have dirty feet. I can't wait to find out more about the Green Bandana Club. I wonder if it's anything like the SGAFO? I am not an orange flower lover but I might need that...I LOVE the fairy footprints. 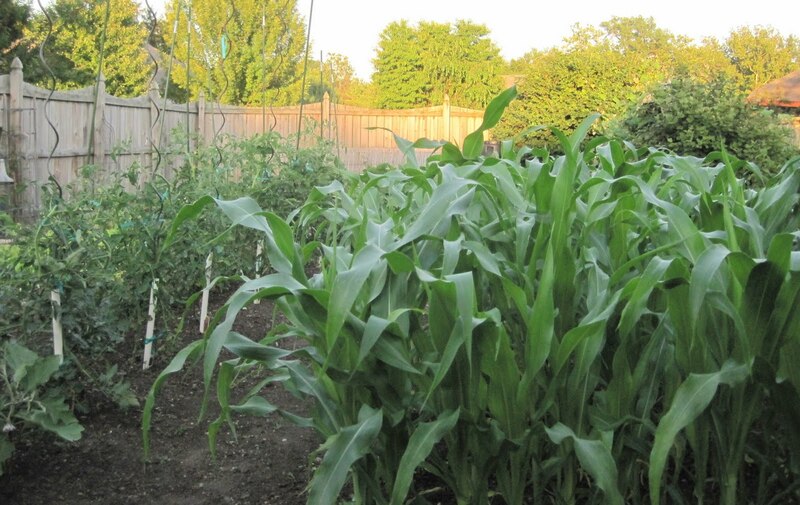 I am so glad your veggie garden caught up to speed, even with the late planting, Carol. Exciting about the green bandana, too, will be interested to find out more. I love orange, and dirty-footed garden fairies, the double tiger is a beauty! Carol, congratulations on the back-page column for Horticulture Magazine this month. Received it yesterday and enjoyed reading about your "eccentricity." Now you got to keep us updated about the Green Bandana Club and to let us know more about it, Carol. I can imagine you finding the green bandana in your garden was a big surprise. How funny...I thought I read "green banana" hanging from your Locust tree! I couldn't imagine that! "Well, that Carol is a wonder getting bananas to grow from a Locust tree, it must be grafted.."
Can't wait to hear about the club, hope it's as fun as a green banana club seems like it would be! "Ploppers Field" could describe every square foot of my garden - love the moniker! Is the green bandana thing like the red hat people - do you have to wear it? Oh my. She is stunning. I am an orange lover for some of my beds that have hot tropical colors and she would be so happy among my other bright and perky day lilies. She looks very happy there and I'm sure she enjoyed the fairy visit! The vegetable garden looks great! And I am breathlessly awaiting more news about the Green Bandana Garden Club.